We’re on the final push. 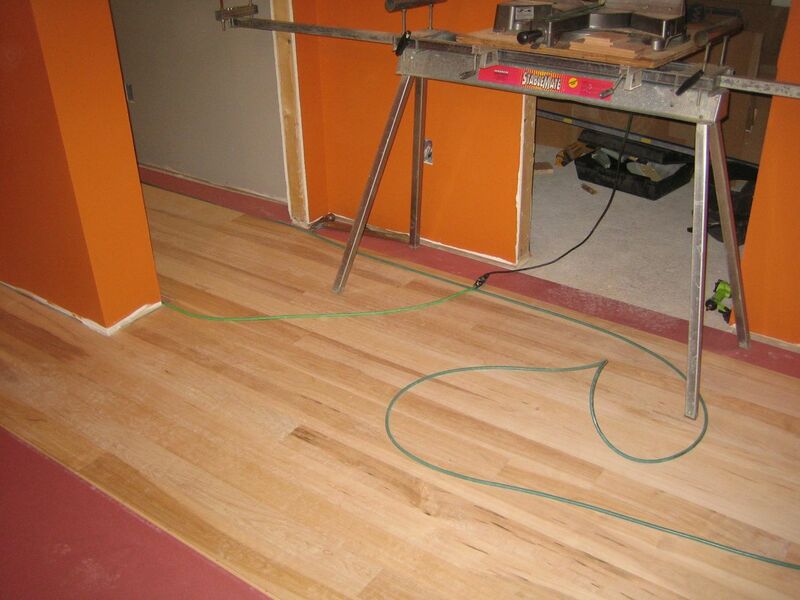 In the last week we finished laying the wood floor on the second floor. 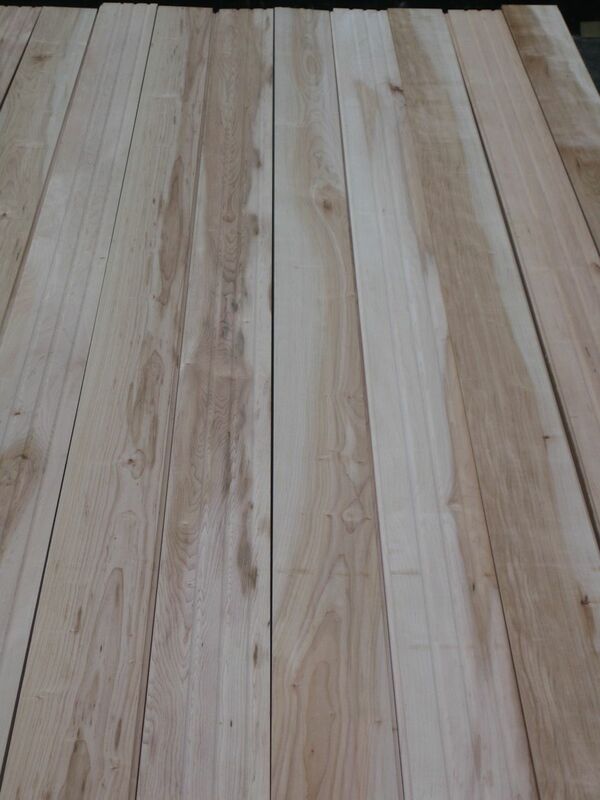 It will be sanded later this week, then we’ll apply a natural whey-based sealer. 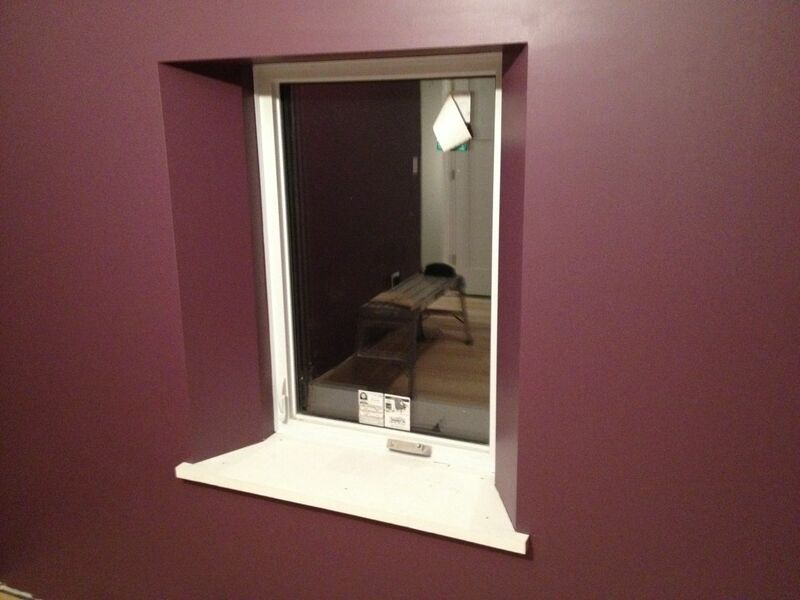 Warren also installed the interior doors and window sills on the second floor. They will get a coat of paint next week. 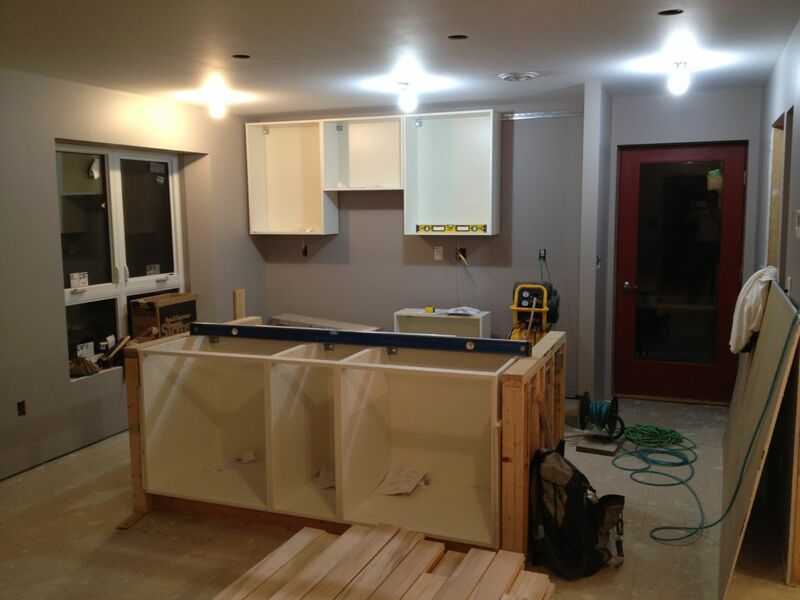 Other progress includes building a base for the kitchen cabinets and island, and assembling the cabinets. We also bid out the kitchen counters and ordered all the appliances on Black Friday. Jill will post later this week on our appliance selections. 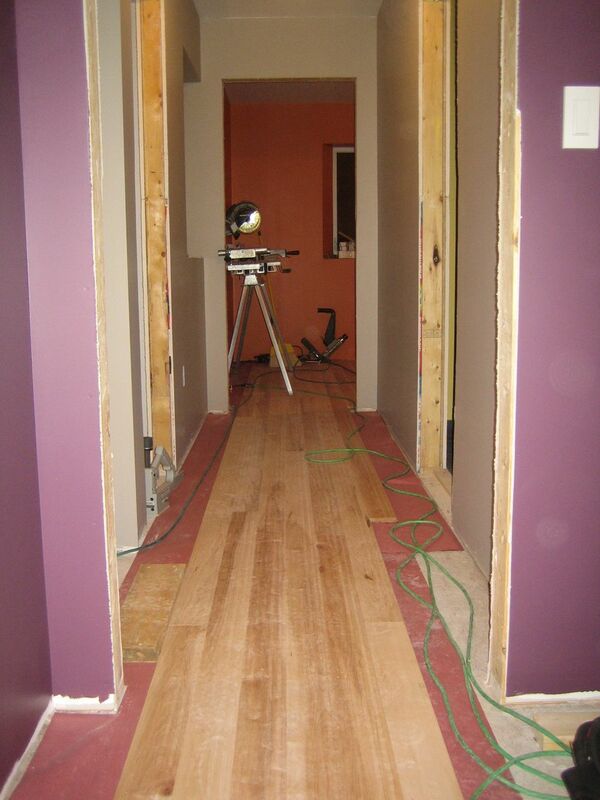 Activities for the rest of the week include laying the wood floor and installing the interior doors on the first floor. 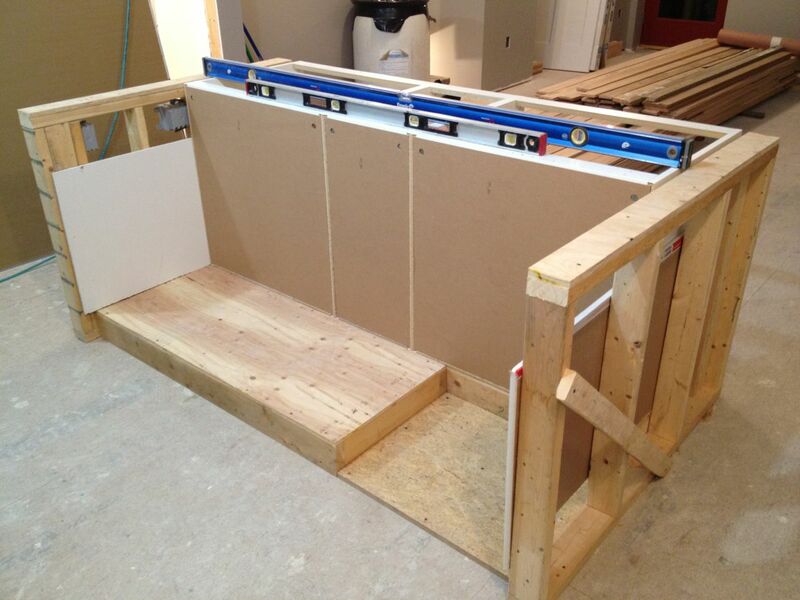 There’s also some small remaining sheetrock and taping to finish the island. Then there’s all the odds and ends, final electrical and plumbing hookups. Stairs. Trim. It’s going to be a busy December! We started installing the wood floor today. Just wanted to post a few photos. 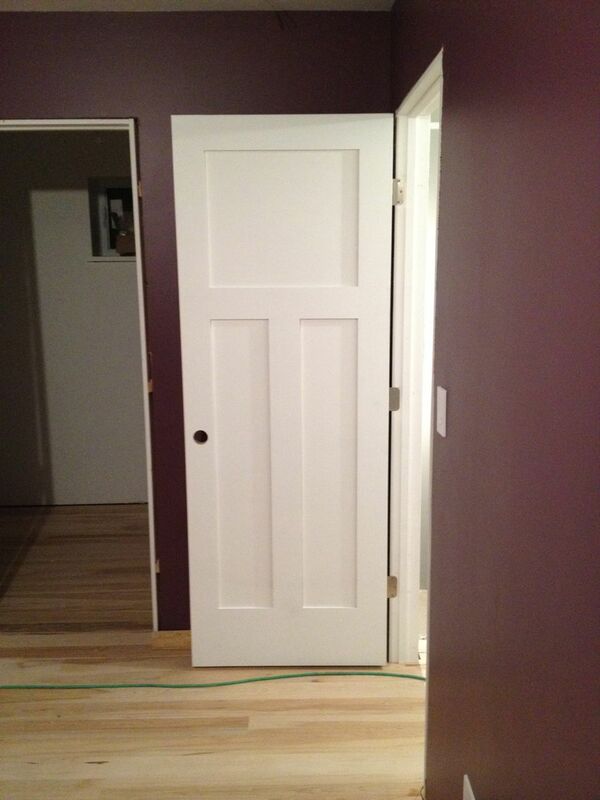 It looks great and will look even better after it’s sanded and sealed. Friday was Ikea day. We drove down to the New Haven Ikea to purchase our kitchen. It’s a budget kitchen. We wanted to do the green thing, but could not justify the price tag right now. We’re also designers and couldn’t justify crappy design and poor craftsmanship of Home Depot kitchen cabinets. The decision would have been a lot easier if a) we had more money or b) Ikea offered an environmentally friendly kitchen line. If you’re not familiar with Ikea kitchens, they keep their cost down by making you do all the work. First you lay it all out in their kitchen design software online, then go into the store and wait (and wait, and wait…) for a kitchen expert to look over your work and tell you everything that you did wrong (but it’s not your fault, they like to blame the application). After some fussing, they help you figure out the details and generate a parts list. You are responsible to double checking the parts list. I recommend doing this over a lunch of meatballs at the in-store cafeteria. Then (if everything is in stock) you go downstairs, pick it up and drive it home, where you assemble into the perfect kitchen. We were fairly lucky. 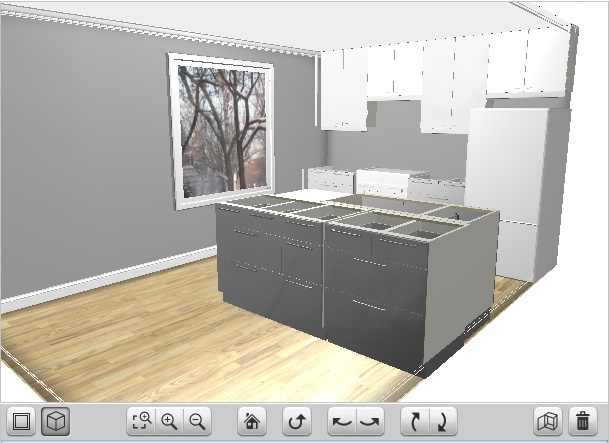 Jill had been working on the kitchen design for a few months using the kitchen design software from Ikea and had figured out how to master the kitchen planning app. 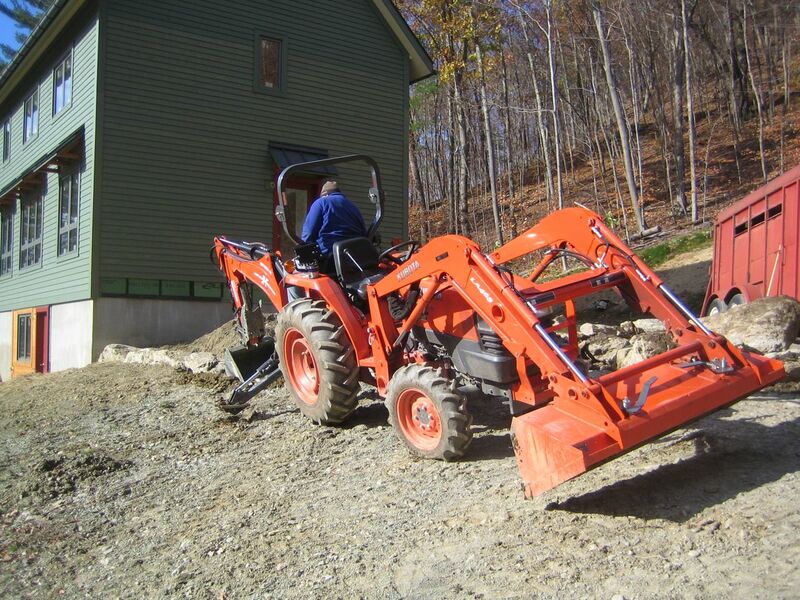 We had only a few changes before reviewing the parts list and checking out. 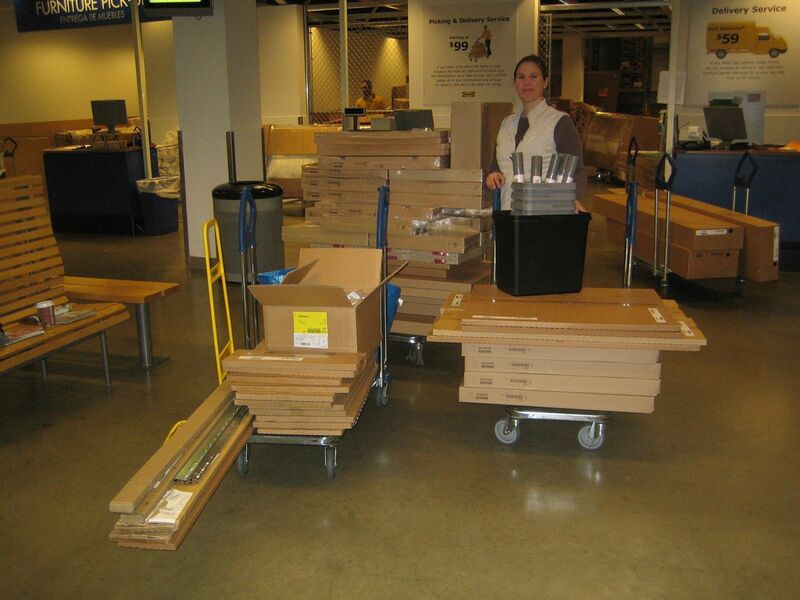 We spoke to some other folks that were on their 3rd or 4th trip to Ikea to work out the details. We were also lucky that everything was in stock and the UHaul truck rental in the lobby had a truck available. So we loaded up on 1,142.7 lbs of Swedish particle board goodness and headed home. Now begins the assembly process. 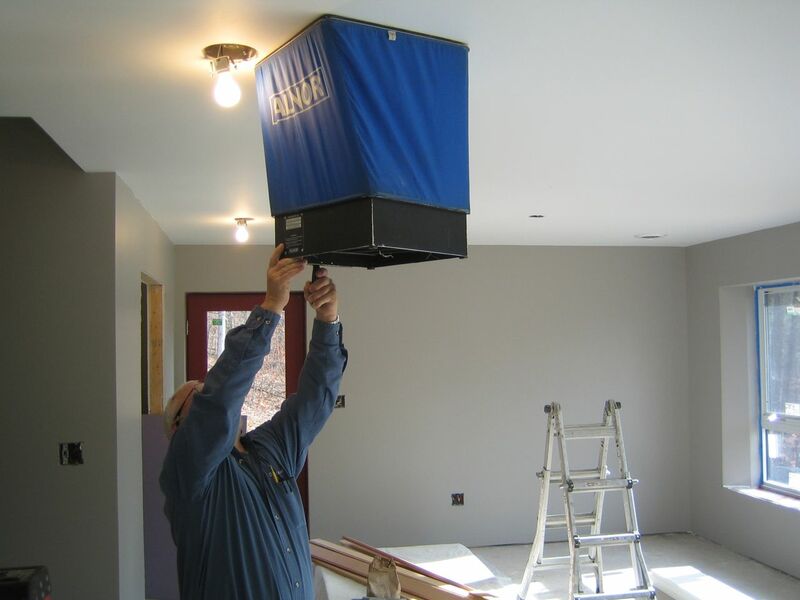 Today Dee’s Electric completed the install of our Energy Recovery Ventilator (ERV). They installed two boost timer switches, one in the kitchen and one in the bathroom. This allows us to run the ventilator on high for a set period of time, while showering or cooking. 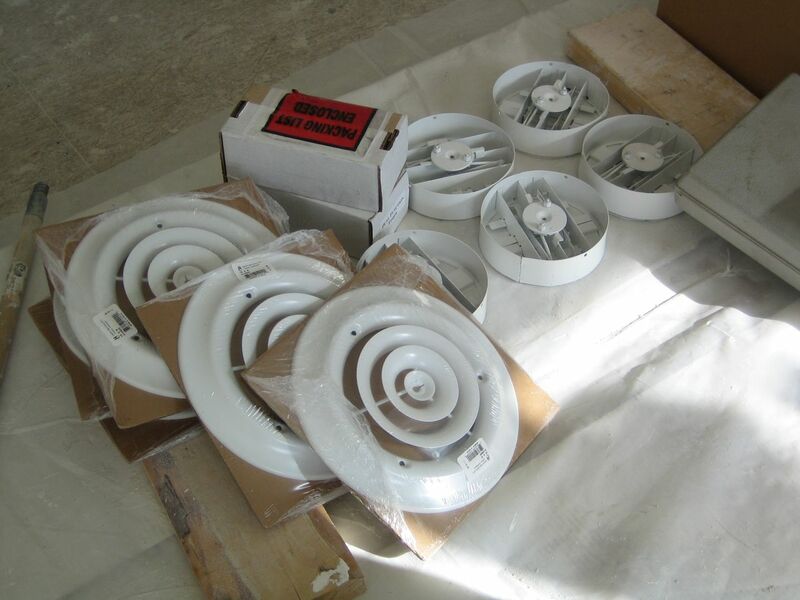 There’s also a main dial switch that controls the speed of the fan, ranging from off to high. 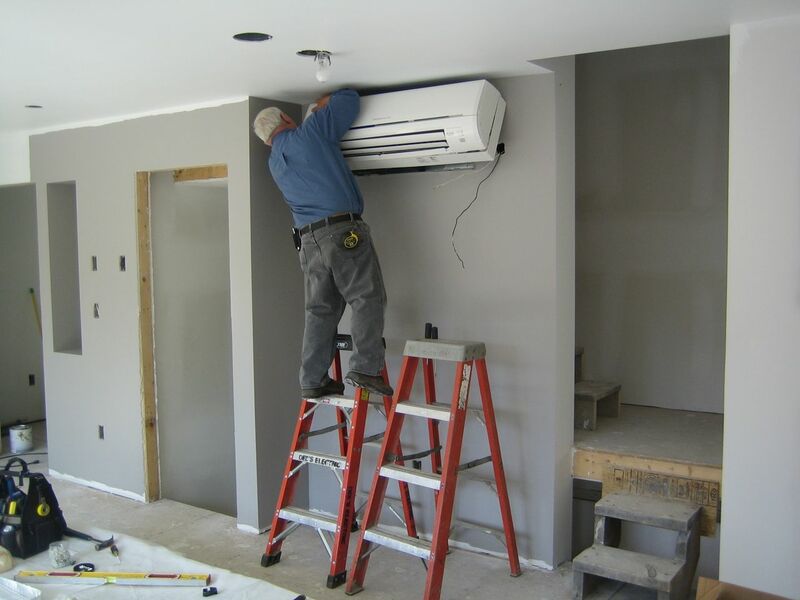 Part of the commissioning process involves adjusting the airflow at each register to ensure the proper amount of air is being supplied and removed from each space. This also balances the system to ensure the same amount of air is introduced and removed from the house, so there is no pressurization or depressurization of the house. They did this by first measuring the actual airflow at each register, then comparing that with the required airflow at that register. 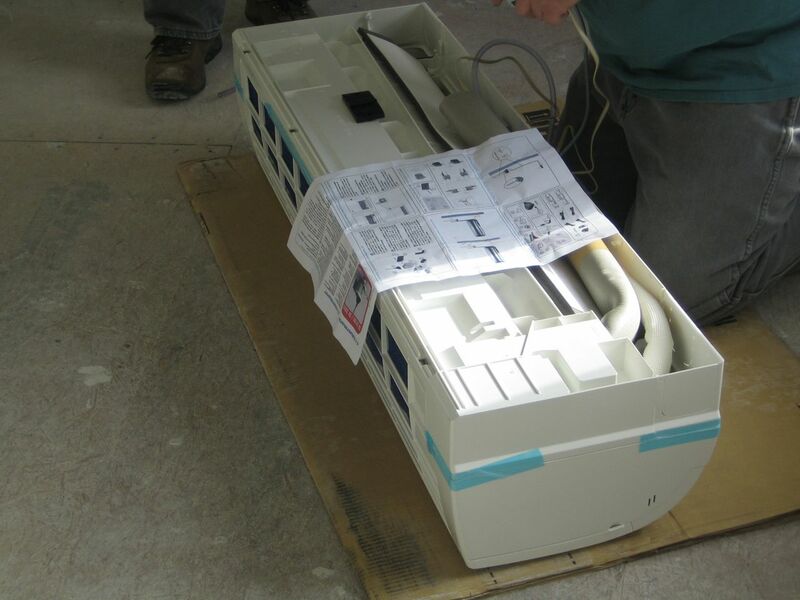 The required airflow at each register was determined by our energy consultants. 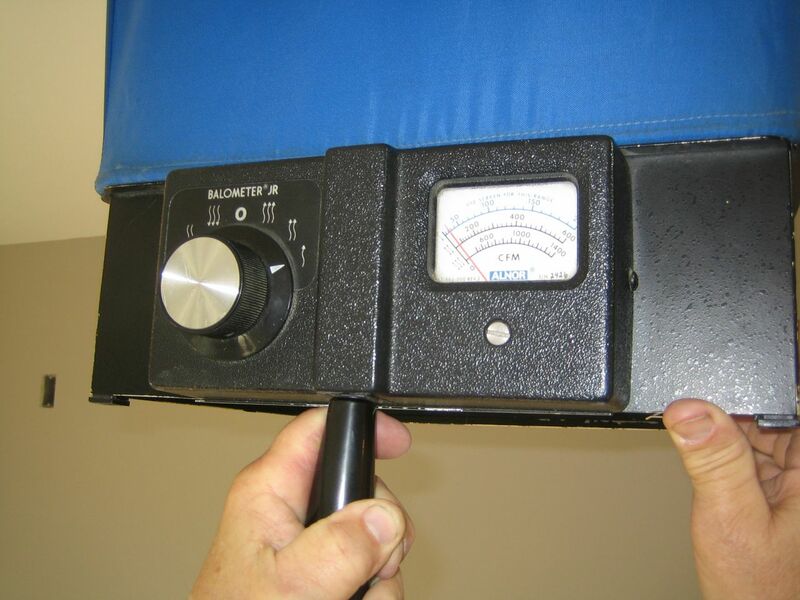 The measuring is a bit like the blower door test, except the fan is the ventilator itself. The device measures airflow at the register in cubic feet per minute (CFM). Since each register is a different distance from the ventilator with a different number of turns and elbows, it requires a little math and a few iterations of adjustments to get everything working as designed. Each vent outlet has an adjustable mechanism to control the amount of air flowing through that register. After all was complete I ran the ventilator at different speeds and walked around the house to see what the noise levels were like. I could feel no vibration from the unit at all in the house. When the unit was running on the low setting I could barely hear the air movement. The air movement was very noticeable running on high, like in a house with a central air conditioned system. Medium speed was somewhere in between. In practice, we will be running the unit continuously on low whenever the windows and doors are closed, and on high only for short periods of time when we’re cooking or showering. That completes the installation of our mechanical systems. 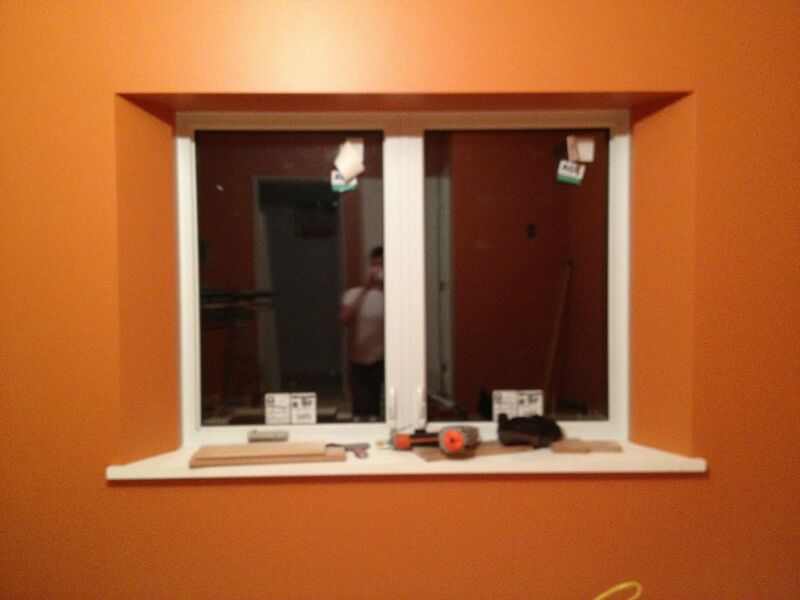 Next is finishing the electrical and plumbing. Tomorrow we’re taking a trip down to Ikea to buy our kitchen. 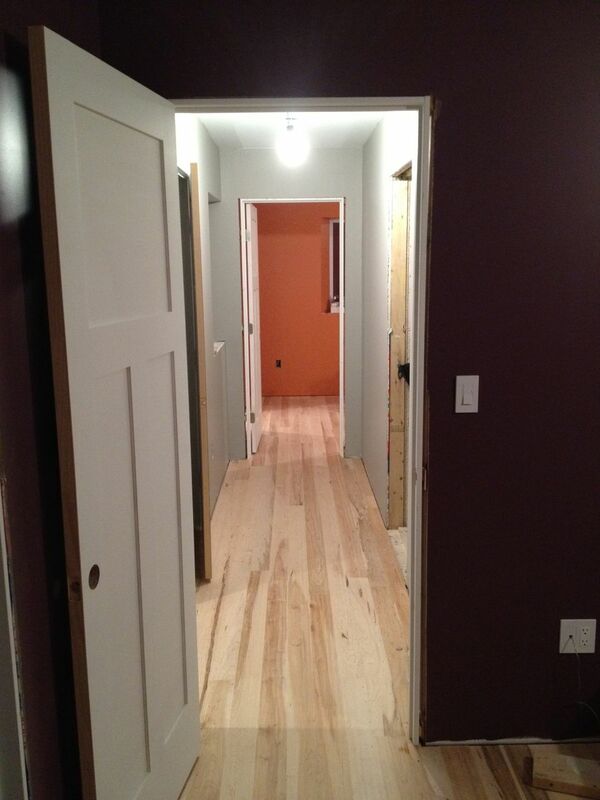 And if the humidity in the house levels off tomorrow, we may get to start installing the wood floor this weekend. 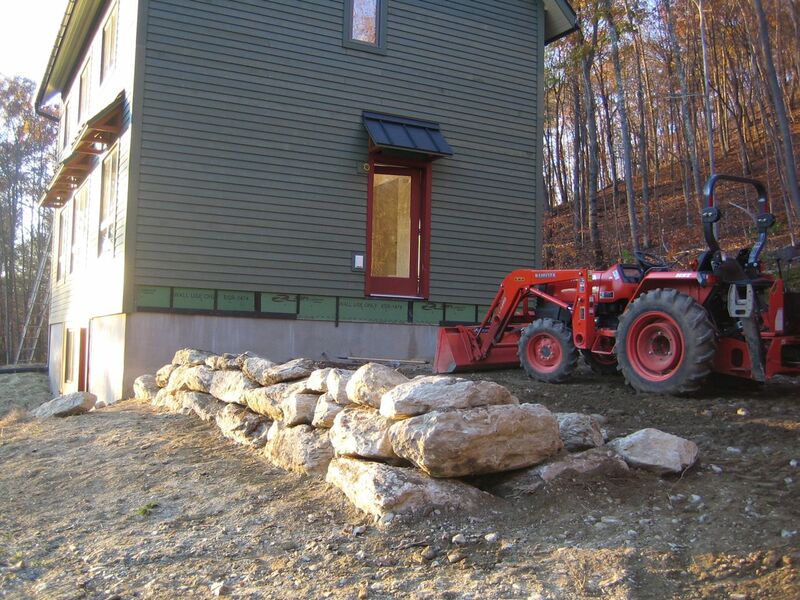 Last year when we had the foundation excavated, we bought a 1000 gallon cistern and buried it under the future porch. It was so long ago and so well hidden that I almost forgot about it. 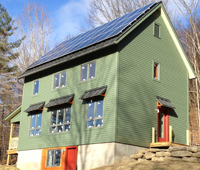 But a few months ago I realized that this would require a bit of research to put together a simple working system that looked like it was designed to integrate with the house rather than tacked on later. Let’s take a look at the components of our planned rain water system. 1) The Tank. We have a 1,000 gallon Bruiser. It has an inlet at the top, an outlet near the bottom and an overflow just below the inlet. 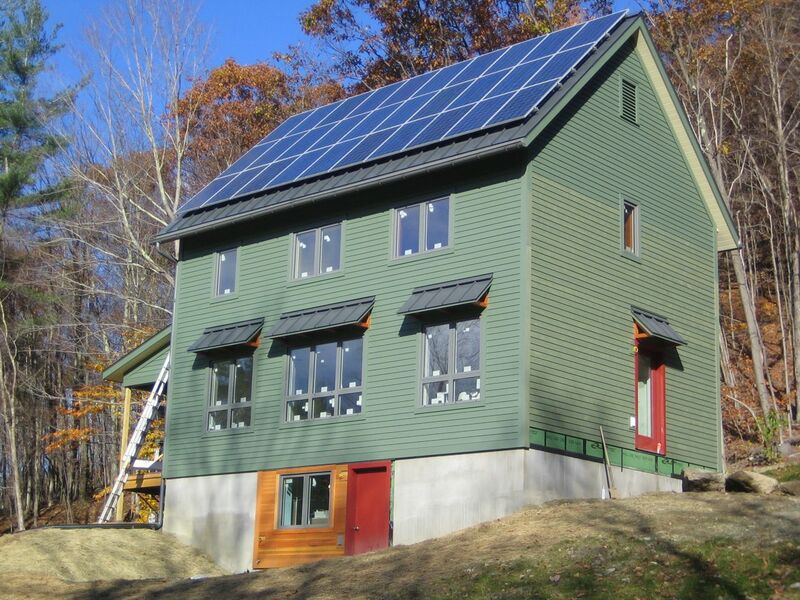 2) Gutters and downspouts. 6″ half round painted aluminum, connected to 4″ round downspouts. One on the front of the house, one on the back. There’s also a gutter on the porch but it will not drain into the cistern at this time. 3) Downspout filter. When I started thinking about how to connect the downspouts to the cistern I knew the hard part was to find a way to filter the leaves and other stuff (dead bugs and bird pooh) out, without bolting some large contraption to the side of the house. 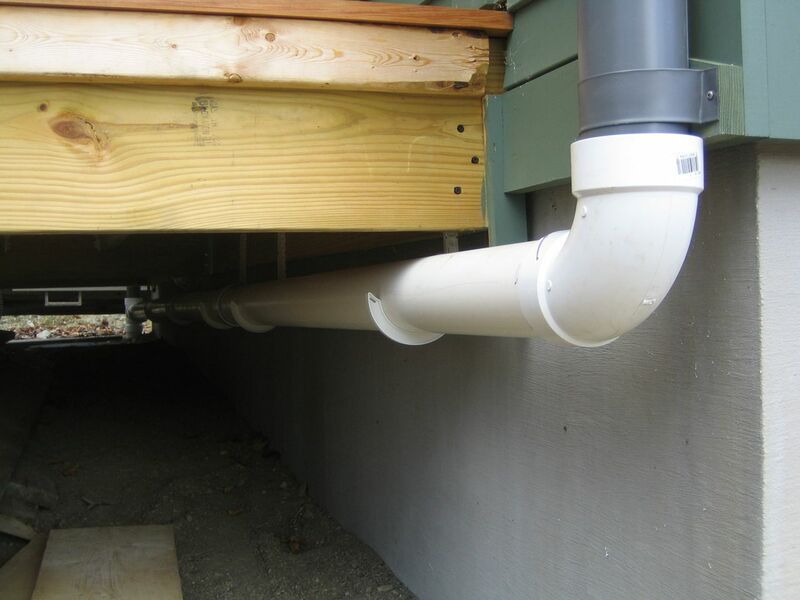 If you’ve spent any time looking around for downspout filters, there’s a lot of different solutions and products out there. Most are u-g-l-y. The first product I found that was acceptable was the Downspout Filter from RainXchange. It appeared to do everything we needed. It’s buried so you don’t see any ugly attachments to the house, and it would filter the volume of water we expected from the roof. 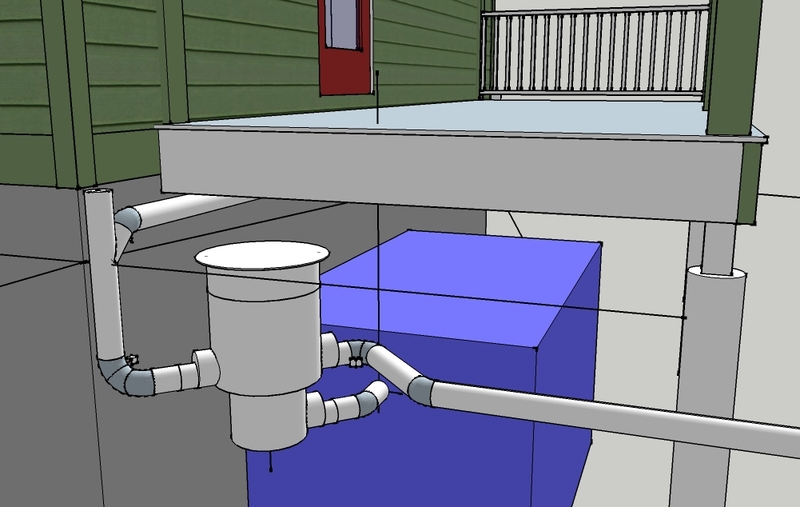 However, I started thinking about how we’d actually route the downspouts to the filter. Because of the slope on the side of the house, I realized we really needed a filter that we could connect directly to the downspouts and have all connections underground. The filter from RainXchange was made to be buried under the downspout discharge. I’d need to find a way to route 2 downspouts to discharge above the filter. Or buy two and position one at each downspout, but because of the slope this wouldn’t work for the front gutter. Shortly thereafter I found the Small Basket Filter from ConservationTechnology. They were recommended by my contractor. They unfortunately never came up on any web search for rain filters, but they had exactly what we needed. A simple filter, easily accessible from above and all connections buried. There is one inlet and an overflow at the same level. The outlet from the filter is at the bottom which connects to the cistern. 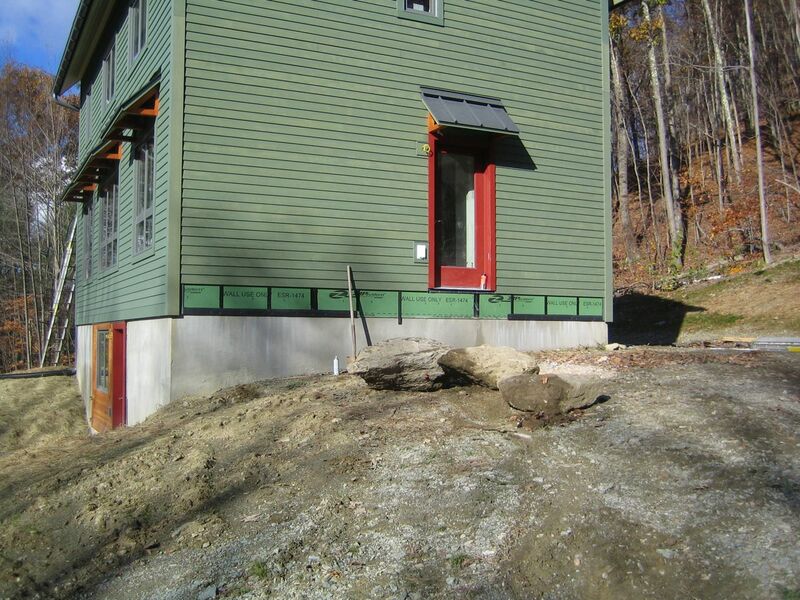 The overflow is plumbed to daylight, downslope and away from the house. 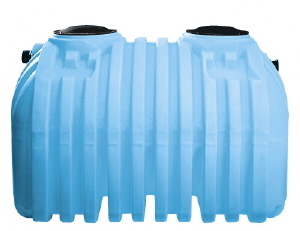 The lid top is adjustable in height making the depth of the filter variable. See SketchUp model view above for underground connections. 4) Connections. 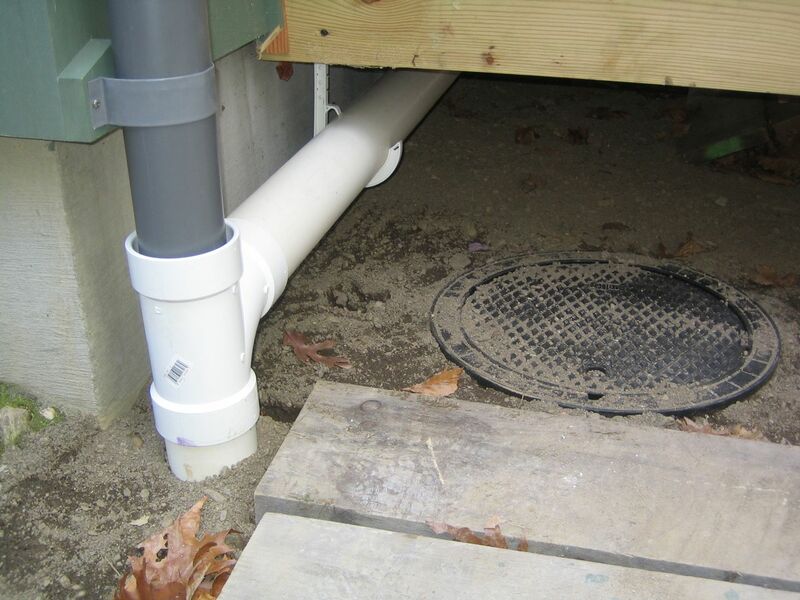 We originally planned to use aluminum downspout components to connect to the filter, but standard aluminum components are fairly restricted. 75 degree angles are the norm, anything else is custom. So we decided to connect the downspouts to the filter using standard PVC pipes and fittings. It won’t be pretty, but neither would the aluminum. The porch will hide most of it, and I’m confident we can find some other creative ways to hide the ugly stuff. 5) Plumbing. 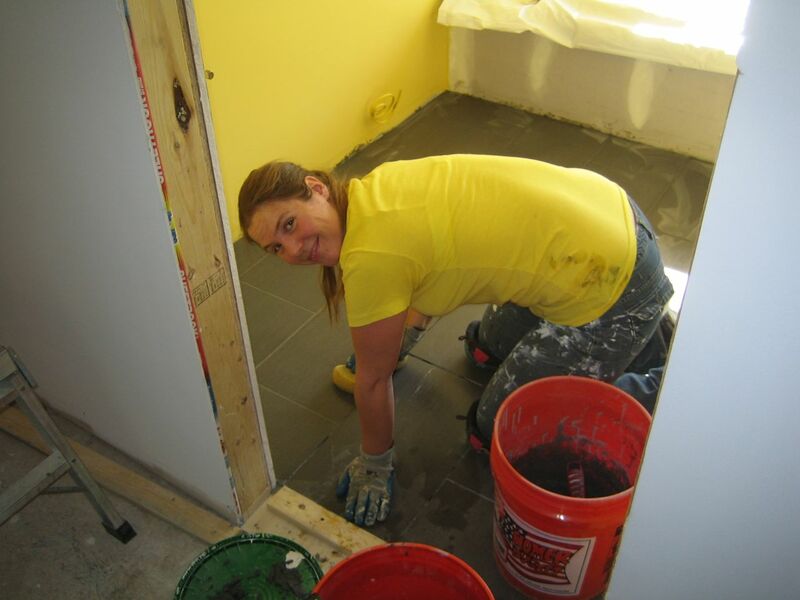 The cistern is plumbed to the basement so that if needed, we could add a pump. Then routed to the exterior. We’re not using frost-free sillcocks. They rely on the excess heat inside the envelope to warm the pipe, but because we have 12 inches of insulation, they would just freeze and leak into the wall. So we’re installing valves with a blowout hole so we can easily drain the pipes each winter. Now we have a simple source of water for our future garden without pumps or the use of electricity. 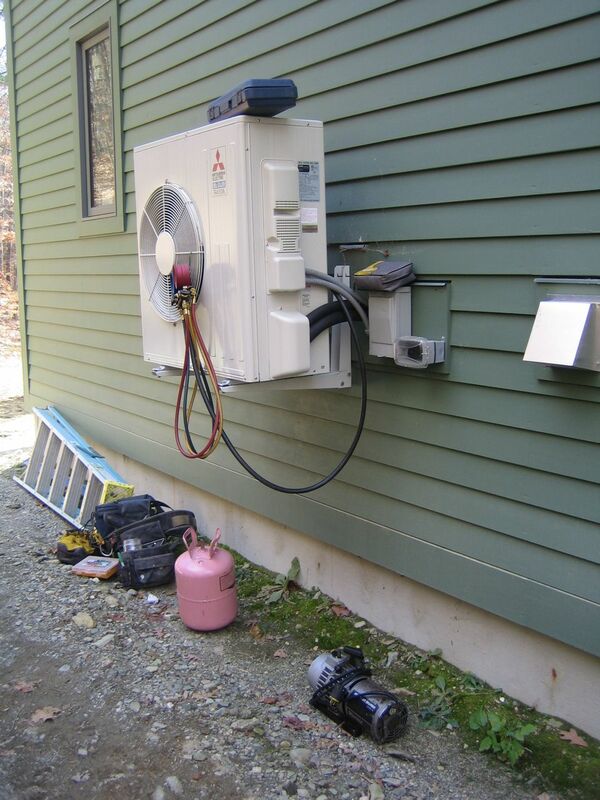 Dee’s Electric came out yesterday to complete the installation of our heat pump. They will have to come back to complete the ERV wiring. I’ll explain a bit more later. I just wanted to post a few pics of the installation. 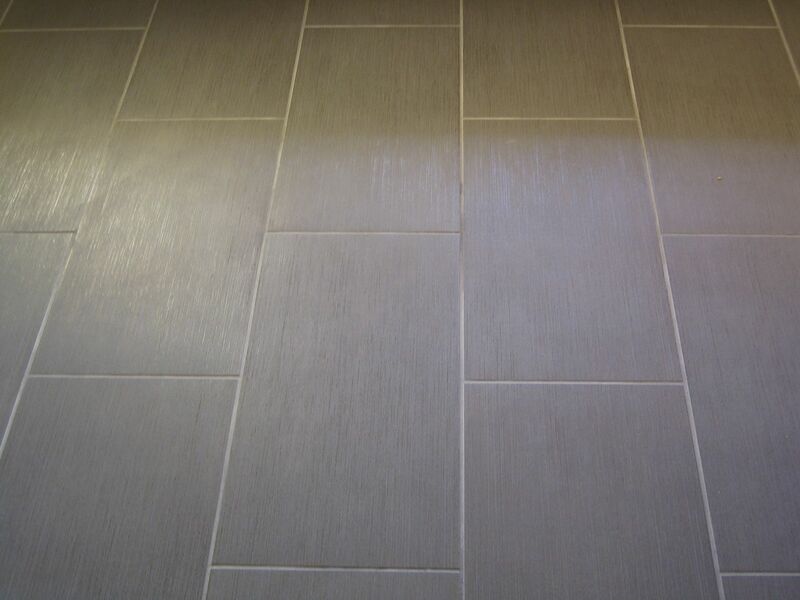 Siding, gutters, wood flooring, stone wall and tile grout oh my! It’s busy time at Uphill House these days. 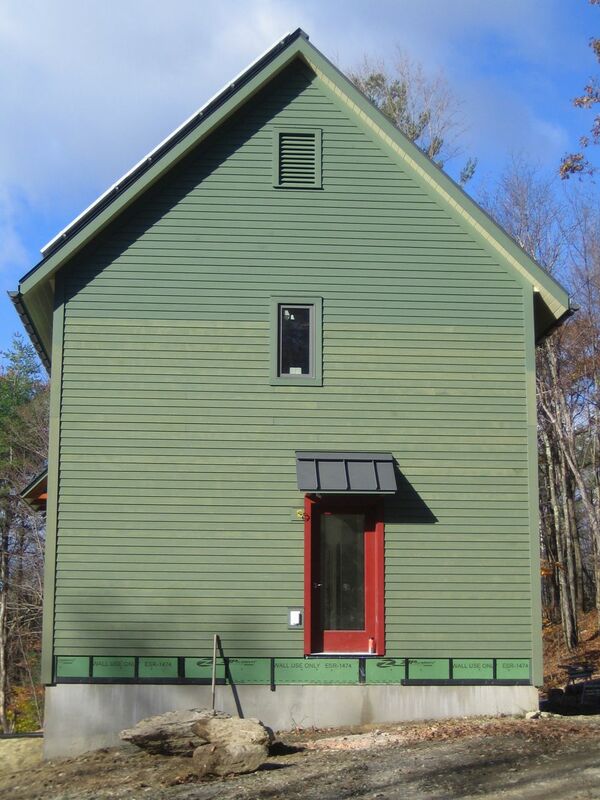 Warren finished the siding yesterday (except for one tiny section where the east entry is going). We started siding back in June, so it was a big milestone for us. The gutters are almost finished too. 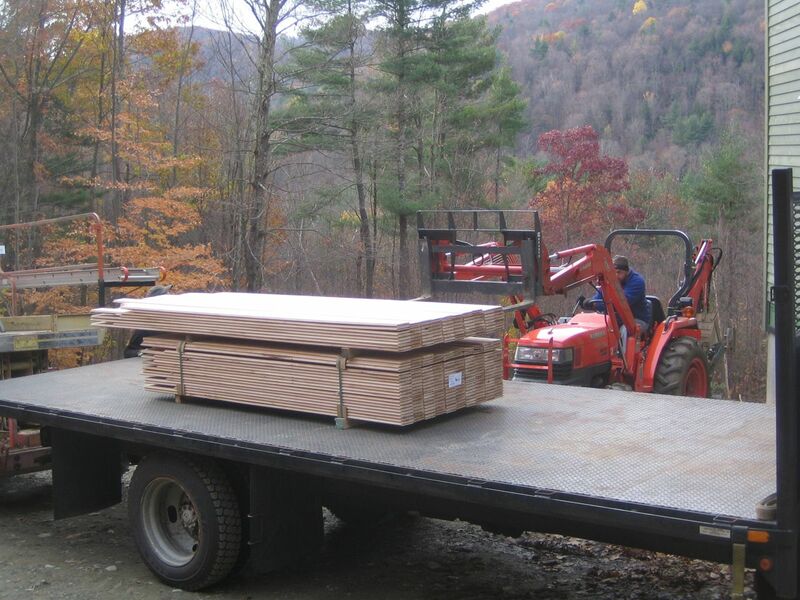 The brown maple wood flooring arrived today from Vermont Plank Flooring. It is beautiful. It has to sit for a couple of weeks to acclimate before we start to install it. 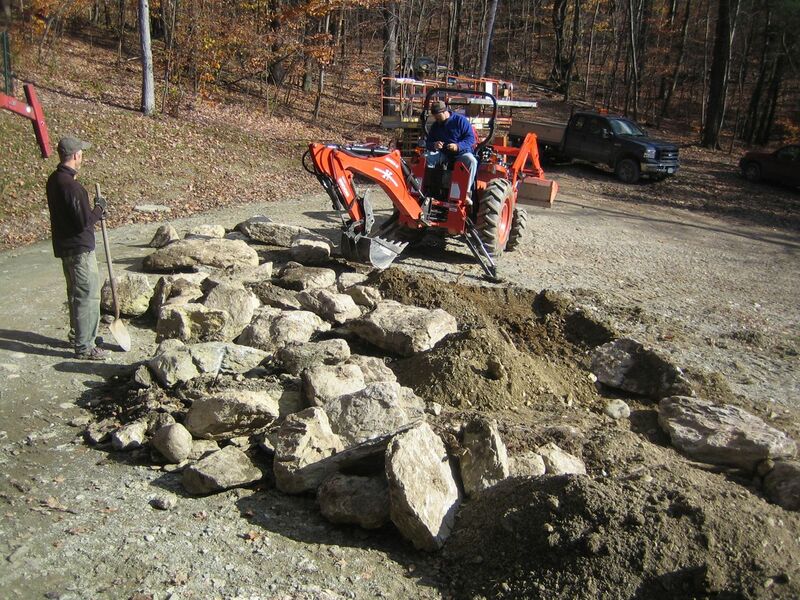 Jill was busy grouted the bathroom floor tile today while Warren and I built a small stone retaining wall that will form the parking area next to the house. 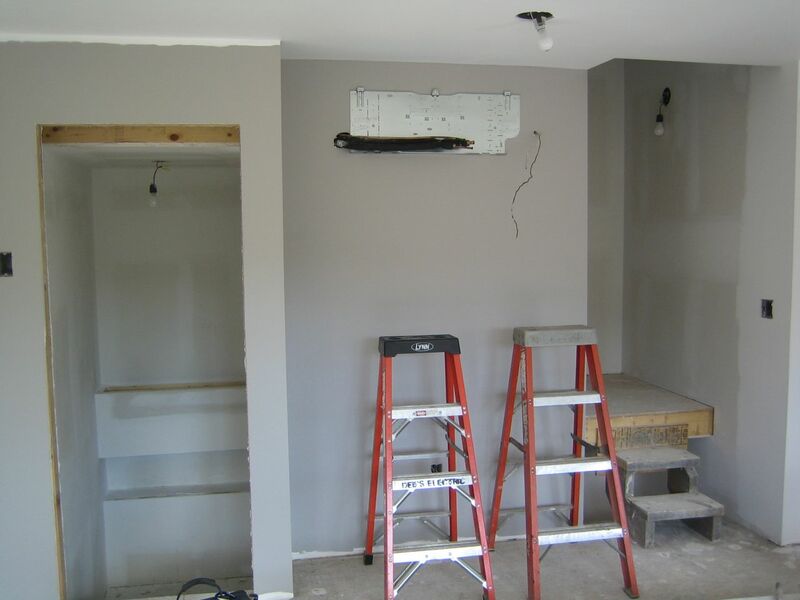 Meanwhile Howie is finishing the taping this weekend and we should be able to start priming the first floor Monday night. 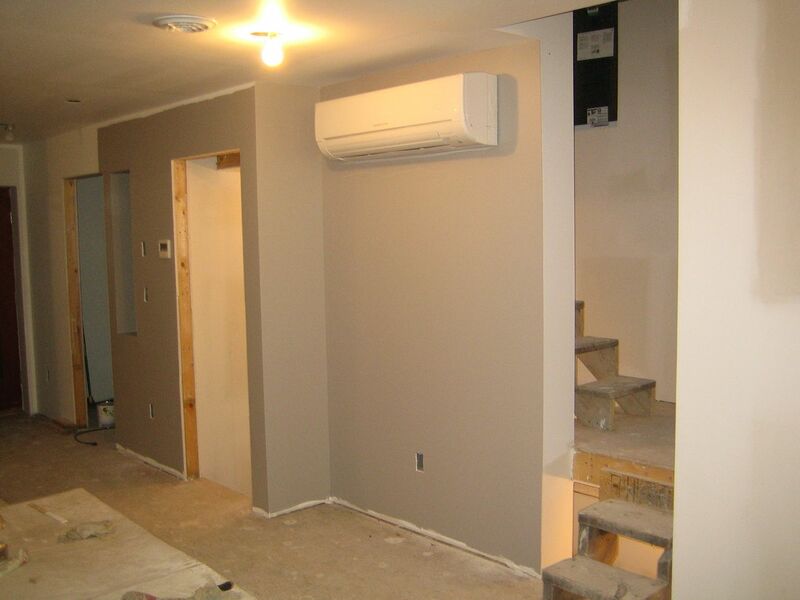 Our HVAC guys are scheduled to install the indoor unit of our heat pump on Thursday. And we’re hoping to take a trip to Ikea to purchase our Kitchen cabinets next weekend. We’re going to need a vacation very soon.